It’s 7 a.m. on Jan. 20, and I’ve been awake through the night. When I asked to interview a member of Lumumba Zapata Collective — the group responsible for organizing UCSD’s role in today’s UC-wide strike, J20 — he agreed under one condition: the piece would be published in advance of the strike. The condition is sensible. No one in the collective has had time to waste on anything that wouldn’t promote the strike. They’ve been planning, meeting and organizing for the entirety of the past few weeks; some of them have been building relationships for years, centered essentially around the same five demands of today’s strike. After interviewing him at 5 p.m. last night, I mention that I plan on staying up all night to write it, and he tells me that I shouldn’t let writing the piece kill me. At this point, it’s clear that the agreement wasn’t as binding or formal as it sounded in the email. But that doesn’t really matter. The strike tomorrow represents cumulative years of organizing and coalition-building. Regardless of who or how many will participate, it will serve as a massive and historic display of an ongoing, if unseen by most, chapter of resistance. People who enjoy reading about stories with protagonists will not find singular faces in the history of Lumumba Zapata Collective. Since its inception in 1968, the group’s identity as a coalition has been paramount. The collective’s framers didn’t sign individual names onto their first demands — then revolving around the creation of what would be called Thurgood Marshall College — and none of the people speaking about the coalition today will be identified by name. Instead, they will be reflective of the collective: an anti-authoritarian and anti-capitalist multiracial coalition, working to develop analyses of how state and corporate power flow manifests in the university. People who enjoy reading linear stories with discreet turning points will similarly find few of these in the timeline of the collective. While the Lumumba Zapata t-shirts made in preparation for tomorrow’s strike made a debut within the last few months, the collective was not merely revived with the election of Donald Trump or by the racist chalkings left outside Raza Resource Centro last spring. Both added a sense of urgency to the collective’s organizing — particularly the latter, as the town hall meeting held two days after the election drew many new participants — but Lumumba Zapata’s efforts in the upcoming strike can be seen as an accumulated effort to make a critique that has been in wider discussion for some time. This is now described by the collective’s five demands: the UC Administration’s denunciation of Donald Trump’s government, sanctuary school status, Hispanic Serving Institution status, free education, and full demilitarization and divestment from toxic UC investments. Within the days following the election results of Nov. 8, the opportunity for larger mobilization arose. As one member puts it, there was a renewed urgency in “struggling against a new manifestation of fascism.” Students and faculty with varying experiences in organizing, from diverse disciplines — many of whom being new to the collective — contributed to the scope of today’s demonstration. Two other members spend the afternoon of Martin Luther King Jr. holiday working on a banner, taking a break to speak with me about the recent weeks. I ask one of them about balance, which proves to be something of a non-question. Balance seems to be an afterthought when the work of planning direct action is too important to just pass on. “We’re balancing it in the sense that we don’t have class today, so today is a great day to work,” one of the members says, which probably rings true for everyone in the collective. The other describes the uniqueness of post-election organizing, as someone who joined within the past year. She describes the election as as a catalyst. Among those catalyzed are two particular segments of the student body. One is undergraduates, who are described as virtually uninvolved as of spring and now a sizable part of organizing. The other is students and faculty from the STEM department, describes a graduate student who wrote the strike’s STEM walkout. 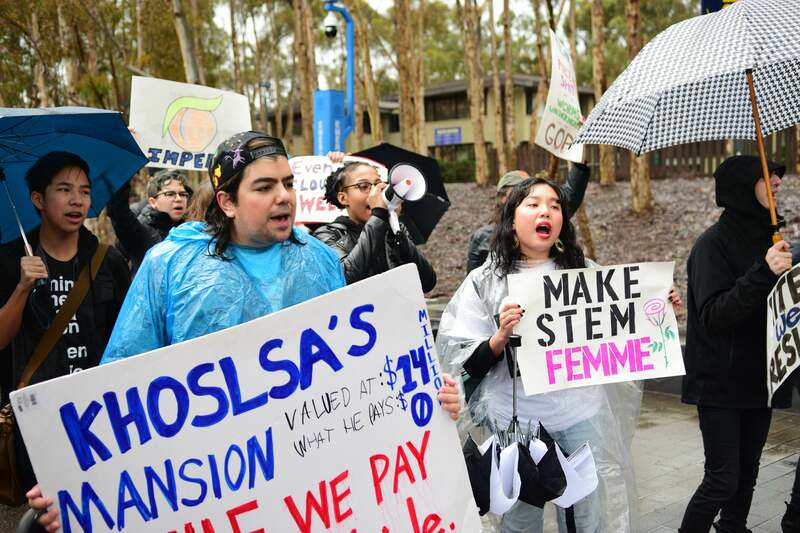 “We adopted some of the materials to be specifically geared toward a STEM audience to try and activate this very large STEM population here at UCSD, undergraduate and graduate, that hasn’t been super active, but I expect will be heavily affected by the upcoming administration,” she says to me, over a pair of posters and markers. “Besides our science funding and research, we’re also going to be affected in the other ways that we are people. Tracing back to the chalkings in spring, the first source further describes Trump’s victory in terms of the sentiment behind Lumumba Zapata’s demands: a manifestation of attitudes in existence far before November, and, in various ways, practiced by the university. One example, he cites, is the abysmally low proportions of Black and Latino students at the university. This is clear from the data set published by UCSD Student Research; one text box accompanies undergraduate enrollment of 2016 by ethnicity and boasts, “The undergraduate student body at UCSD is ethnically diverse; approximately 71 percent of undergraduates are students of color.” The data to its right illustrates that 70 percent also fall under the two categories of Caucasian and Asian, while 18 percent collectively describes the enrollment of African-American, Mexican-American, Latino, Native-American and Filipino students, despite these populations being far higher throughout California, whose people the university was created to serve. In many ways, Lumumba Zapata Collective of today isn’t far different than its namesake, which the collective’s website describes as being birthed through the fight for an “alternative education model that focused on the liberation of domestic and global communities of color … and centered a critical analysis of racialized global capitalism and its discontents.” Named after Patrice Lumumba, the first Congolese Prime Minister, and Mexican revolutionary Emiliano Zapata, the collective in the ‘60s and ‘70s formed as a coalition between the Mexican American Youth Association, known today as Movimiento Estudiantil Chicano de Aztlán and the Black Student Council, now the Black Student Union. Of the collective’s first demands — including classes such as Analysis of Economic Systems, including “the crucial roles played by colonialism, imperialism, slavery and genocide” and an admittance guarantee of 35 percent Black and 35 percent Brown students — those that continued to be honored years after the resolution agreed upon by then-Dean George Murphy would dissipate. The proposed name for the college, Lumumba Zapata College, was not favored by administration. An advisory board created in regards to admissions, for one, was completely abolished. In every way, the demands of today’s collective as part of the J20 strike can — and should — be seen as essential rather than ultimate, coming from a coalition of people who have been organizing not around a specific ideology, political disposition, or discourse but instead an ethos and a feeling that threads each demand. This much becomes clear in discussing the collective with any member. There’s a collective struggle, and a high regard for and presence of trust in the group, which separates it from more politic-centric groups that exhibit less interconnectedness among members. Beyond learning from previous movements and attempts, successful and unsuccessful alike, there’s an explicit feature of the coalition which is linked in our conversation to antimiscegenation and redlining: the collective as a body of people comprising a plurality of racial groups. In the way that the action leading up to the strike culminated overtime, what happens after the strike is not untraversed. Rather than being anything of cathartic or spontaneous nature, the collective will review the strike and continue moving forward. As one member suggested next to the banner on MLK holiday, it’s something every student should be concerned with.